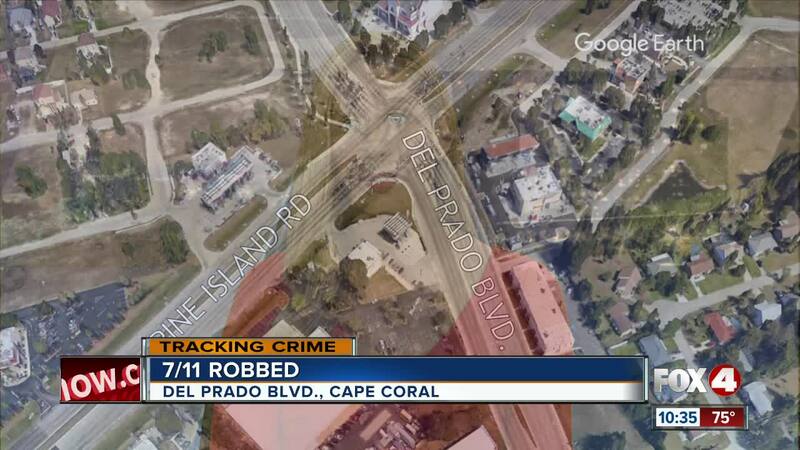 CAPE CORAL, Fla. --- Cape Coral Police are looking for a suspect in connection to a robbery in Cape Coral early Saturday morning. Investigators say the incident happened at a 7-Eleven convenience store on the 790 block of Del Prado Boulevard North. According to a witness statement, the suspect told the clerk he had a gun and then took $50 from inside the register. The suspect was last seen leaving the store on foot headed westbound on Pine Island Road. Investigators say he may have had a car parked nearby. No one was injured and there is no immediate danger to the public. The suspect is described as a white male, approximately 40 years of age, with a tattoo sleeve on both arms, short dark hair and was wearing a plain white t-shirt, black pants, and black sneakers at the time of the robbery. Anyone with information is asked to contact Cape Coral Police Department at (239) 574-3223.